The Los Angeles Rams defeated the Houston Texans on Saturday evening, 21-20, continuing the third full week of preseason action in the NFL. There wasn’t much to see of second-year quarterback Deshaun Watson, but the good news is he moved around freely and did look healthy. The bad news is that his health will be put to test behind the Texans’ porous offensive line this season. Saturday, the offensive line looked shaky from the get-go, with the backups struggling even more as the game progressed. Running back Lavon Coleman isn’t a name on the radar of many, but he was impressive when given opportunities, showing some sharps cuts and an ability to drag tacklers with him. He really added something to the running game. The Texans will be pleased with the short work that J.J. Watt and Jadeveon Clowney put in with their first-string defense. Watt showed flashes of his old self, shedding blocks with ease. Clowney added a batted pass that should have led to an interception. The Texans’ defensive starters overwhelmed the Rams’ backup offense. Safety Kareem Jackson seems destined to have a versatile role in the Texans’ defense this year. His ball skills were on display with his first-quarter interception of Sean Mannion that capped off a dire start to the game for the Rams’ backup quarterback. Alone in the flat, Jackson jumped a crossing route by receiver KhaDarel Hodge, holding onto the ball through contact with his own teammate to set the Texans up inside the five. Rookie running back John Kelly shouldered the load against the Texans and offered more than a glimmer of promise on the depth chart behind Todd Gurley. He capped off the best drive of the day for the Rams with a 15-yard run on third-and-goal, as he weaved through the heart of the Texans defense with decisive cuts, spinning through arm tackles before entering the end zone. Third-string quarterback Brandon Allen produced his best work on third downs, both with his arm and his legs. He picked up one conversion on a scramble up the middle to push the Rams into the red zone. He also set up a couple of conversions on the Rams’ long third-quarter drive with strong throws to out-breaking routes to keep the Rams’ backup offense on the field. The Rams showed some strong depth up front, as they went to work on the Texans offensive line with second-year edge defender Ejuan Price being the standout. He picked up two sacks, though one was negated by a penalty after a vicious spin move left Texans tackle Chad Slade grasping at thin air. It remains to be seen who will start opening week at linebacker, but Ramik Wilson’s play of late warrants some serious consideration. Wilson closed quickly in coverage and did a good job getting off blocks. Houston: Houston’s offensive line looked shaky from the start, only to struggle even more as the game progressed. Los Angeles: Once the Texans’ starting defense left the field, the Rams’ backup offensive line took control. 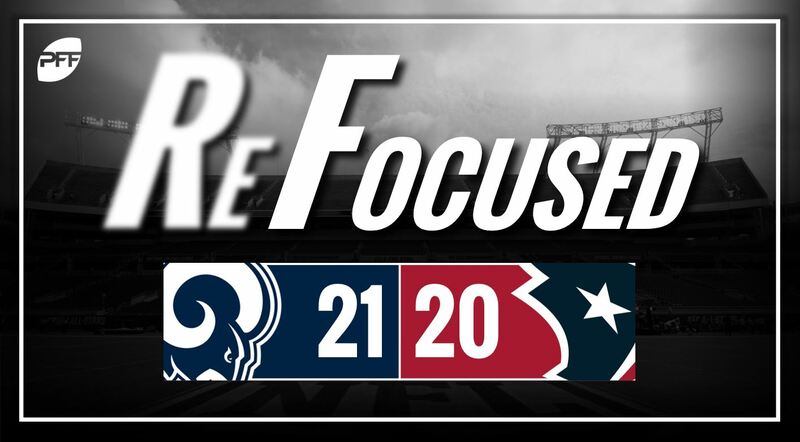 Mental errors were at a minimum and steady play in various combinations allowed the Rams to keep moving forward against the Texans’ backups.